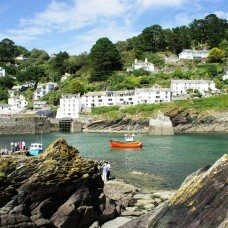 Close by are the historic fishing towns of Looe and Polperro. Rich in salty atmosphere, their harbours are busy with colourful working boats. Early risers can visit the market at Looe where fish merchants choose the freshest fish for tables all over the country. There is a choice of cafés and restaurants, many specialising in local fish dishes, and a full range of shops, galleries, and small town facilities.